Brainstorm Media presents a documentary by Thymaya Payne. Running time 90 minutes. No MPAA Rating (Language). Thymaya Payne's "Stolen Seas" is a documentary of such ambitious scope that you might need a remote control and a notebook to keep up with it. The film chronicles the hijacking of the CEC Future, a Danish ship traveling just off the coast of Somalia, on its way to Indonesia. As the film takes us through the intense ransom negotiations, it also gives us a complex history of Somalia. The footage, reenactments, and interviews are so dramatic that I sometimes wondered if I was watching a faux documentary. The editing and soundtrack recall recent action films, but this is the real thing. In November 2008, eleven pirates armed with Kalashnikovs board the vessel and quickly take control. We learn almost nothing about the hijackers or their leader, Omar. Instead, the calm, mysterious Ishmael Ali negotiates in fluent English with the Clipper Group, who own the craft. He demands $7 million. Ali is a single father who raises camels back home in Somaliland, one of the states that make up the greater nation. For 20 years he lived in the United States but left because of the stress. Now, he tells his story while reclining on pillows under the cool breeze of a fan. The only thing that seems to get under his skin is any suggestion of racism. He claims he became involved with pirates by simply looking for a job. We do not discover until the film's end if he is a hustler or a naïve participant in a serious conflict. The movie explores our romantic attraction to pirates, swashbuckling figures from a forgotten time. Ali asserts that young Somalis are also drawn to the myth of pirates, with rap music that recalls our own glorification of gangsters and pimps. These privateers see their jobs as a reflection of the lack of legitimate work on the mainland. The Jolly Roger flag as a symbol of death becomes a symbol of their own lifelessness: they have nothing left to live or die for, so they are unstoppable. 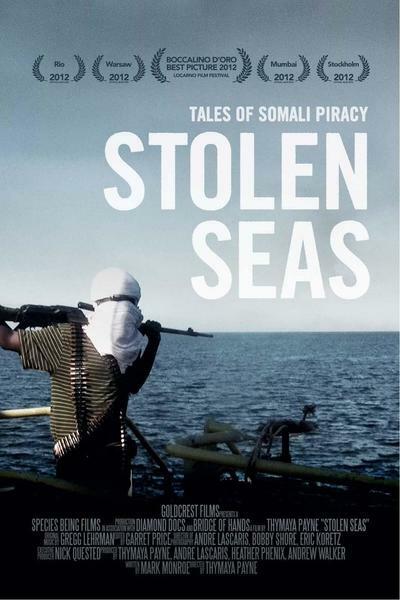 The pirates see themselves as victims of international thieves who steal their countries fish and resources. To make matters worse, the coastal waters of Somalia are tainted with toxic chemicals dumped by organized crime syndicates. All this has contributed to a famine that has killed more than 20,000 children. The film seems to imply that the famine exists not because of a drought, but because all the food is stolen or poisoned. In between history lessons and critical political commentary, the film returns us to episodes in the negotiations over the CEC Future. The Clipper Group offers $400,000, far short of the original demand. Ali continues to negotiate, claiming to be a mere translator for the pirates and nothing more. Conversations get heated. Hostages share their feelings of fear and desperation. The corporation increases its proposal to $700,000, which is still too low. While our image of Somalia may be one of warlords and "Black Hawk Down," "Stolen Seas" makes it clear that this nation's story is far more complicated. Decades ago, its leaders aligned themselves with the USSR. The Soviets forced many changes in Somali lifestyles, making them transform their centuries -old culture from farming to fishing. When the Soviet Union collapsed, Somalia's government soon followed, destroyed in a civil war. Today, however, it is a stable nation composed of ten independent states, except that it lacks a solid economy. Talking heads in the movie tells us that they are surprised by how peaceful the region is, despite its contrary image. Interestingly, the CEC Future is a Danish ship, but keeps a "Flag of Convenience" from the Bahamas. The idea is that some countries offer cheap usage of their flags, allowing the larger corporations to bypass the legal restrictions of their own states and treaties. To protect these giant fleets against the pirates, some twenty nations fill the Gulf of Aden, between Somalia and Yemen, with war ships. When pirates take these ships, their corporate owners would rather pay ransom than prosecute. Ransom is cheaper. In interviews with the Danish businessmen, there is a sense that even multi-million dollar demands are rather mundane. Under these circumstances, pirates will likely remain part of the economy for the foreseeable future. So, the movie asks: Why is the gulf so full of warships? The filmmakers claim that industrialized nations, including China, use piracy as an excuse to test new battleships and weapons. Otherwise, their unnecessary presence only complicates the problems. The talking heads in this film seem to be so skeptical, so far to the political left, that it becomes difficult to evaluate their assertions. Nevertheless, "Stolen Seas" is one of the more dramatic documentaries I have seen, recalling Tony Scott's "Enemy of the State" with its quick edits and pounding score. Commentators express their hopes that the international attention given to the piracy will draw attention to the famine. But, faced with the complicated economics of these coastal waters, it makes no suggestions on how to fix things. And so, the despite the film's satisfying ending, the situation it depicts seems stagnant, and thus hopeless.